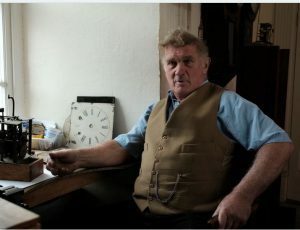 Hello, my name is Conor and I am taking care of the Antique Restoration Services at Old Chairs under the guidance of Nigel and Pepie as they approach retirement. 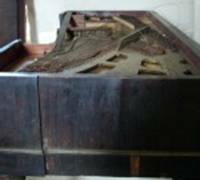 Below are the Antique Restoration Services that I can provide. Click on the image of the service you require for more information. At Old Chairs Antique Restoration Services is our business. Antique Restoration means returning a piece to some former state. Not necessarily as it was when originally made; That would be Renovation. (Which we don’t do) There is no such thing as restoration to museum standards: Museums preserve and conserve they do not restore. So Conservation means preserving the sense and integrity of what remains, saving it for the future enlightenment of mankind. 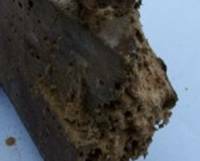 If you’re not sure, contact Institute of Conservators-Restorers in Ireland or Heritage Council of Ireland for specialist conservation advice. Restorers often encounter pieces of furniture which might be deserving of conservation. The restorer then has a professional obligation to advise and inform his client. The practice of conservation also implies a more formal approach to documentation and record keeping. Procedures are set up for agreeing any work that will alter the piece, with the client and/or any interested parties. 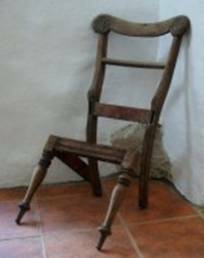 We don’t just repair chairs and the same rules apply to most antique restoration work. Rule 1: If you own a piece of antique furniture you can do with it as you like. BUT in making a mend, just pause to consider the word “Irrevocable”. In 50 years time will it be possible to make further repairs but the piece may be more rare and valuable. Rule 2: In making a repair, return the piece, as far as possible, to the way the original maker intended. Rule 3: Don’t invent new ways of joining wood components together. 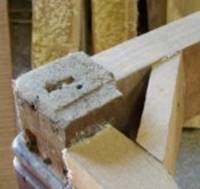 Which means don’t screw screws into mortice and tenon joints because it only weakens them further and makes restoration a whole lot more difficult. 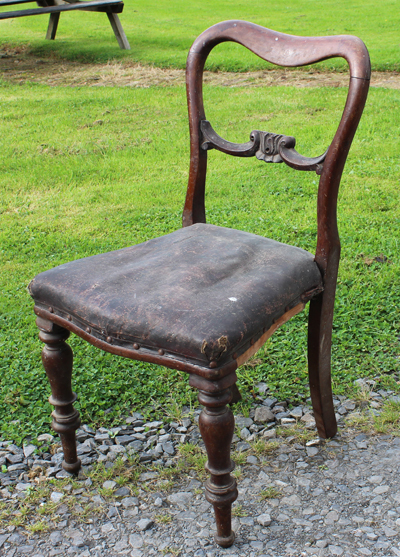 Quite often when chairs are in need of re-upholstery, they have developed wobbles and loose joints. If those faults are left unmended, the damage quickly spreads. Mostly it’s just a matter of re-gluing the joints but quite often, new corner braces are needed and in more extreme cases, whole new pieces. The idea of knocking a chair to pieces in order to re-glue it seems quite drastic but it’s the best way to get the frame back to a serviceable condition: We don’t waste our time re-upholstering unsound chair frames. The Beechwood frame of this mid-Victorian gentleman’s armchair has been re-glued and the mahogany show-wood re-polished ready so the chair is now ready for re-upholstery . Corner braces are often overlooked and replacement poses some questions about what is “right” or “wrong”: The purists would say replace exactly as the original but sometimes, damage to the structure has to be offset by a more robust brace. An open brace that is the same depth as the seat frame is usually sufficiently strong to compensate for loss of strength. Styles of corner braces changed over the years so they’re indicative of the age of a chair. Whenever possible its good to leave an original in place. The picture here shows two upturned chair legs. One has a replacement part fitted to make up a loss of about 35mm from the length: In the foreground you can see a replacement and the worn part that has been removed. 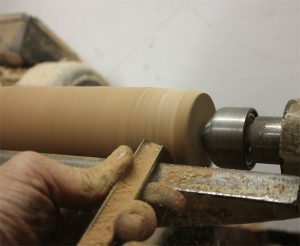 The replacement is made at an appropriate turning detail. The problems with this type of wear are that it not only makes the chair too low and awkward to sit on, but, worse, altering the geometry of the chair changes the way that the load it carried and so it places additional stress on the seat-rail joints: This type of wear (or the removal of front castors) often precipitates breaks at the front end of the side rails. 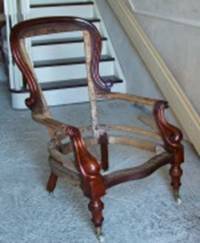 From the early 18th century, exotic timbers (mahogany, Rosewood etc) were used to enhance the look of antique chairs but European woods were still used to make the frames: Beech, Ash, Sycamore Elm and softwoods are prone to furniture beetle attack. Sometimes replacement of damaged parts is the only alternative and using the right wood in the right way is important. Turning is an essential skill in antique furniture restoration work. Carcase Furniture (chests of drawers, desks, bookcases etc) develop different types of faults. General wear – parts like drawer runners tend to get rubbed away and eventually need to be replaced or patched. The sliding surface of the upside-down drawer here shows very pronounced wear from left to right which, if not corrected will erode the rebate that holds the base-sheet. 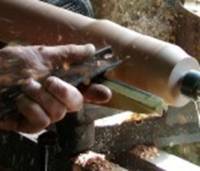 Mechanical damage – scratches and knocks – corners and edges are prone to impacts and especially, the small wood bead that projects around drawer fronts (the cocked bead) is very vulnerable to heavy handed polishing. The idea of the cocked bead is that it prevents the edge of the drawer from snagging on the facing veneer of the carcase. Replacing pieces of edging is more a matter of matching the wood type and colour, than the physical shape. 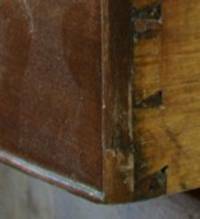 Dampness caused the veneer to detach from the softwood carcase and both the carcase and the veneer have deformed. Some pieces have disappeared and the losses will have to be replaced after the carcase has been stabilised. The problems have been exacerbated by the loss of the protective French polish. There are a few specialist veneer suppliers but veneers made from exotic woods can be difficult to match. From time to time, carved detail is detached and lost from antique furniture. 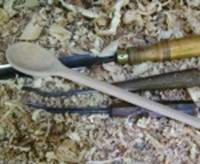 One of the best ways to develop intuitions about how wood works is to practice carving small things first: Making wooden spoons is highly recommended. 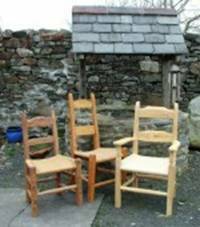 These traditional Irish country chairs were all made here from local wood, mostly Ash: Unlike cabinet –making, the idea here is to get the most out of the available wood with the minimum of tools.